Manufacturers of explosives routinely clean their equipment and work areas with steam. The wastewater generated during the cleaning effort is collected and treated at on-site wastewater treatment plants. 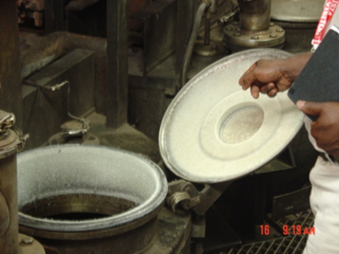 Steam cleaning is a phase transfer procedure, meaning the explosives are simply dissolved and not destroyed. When the residual water dries the explosives recrystallize and pose an explosive hazard. Steam decontamination also generate a significant amount of reactive wastewater (i.e., a hazardous waste) that must be disposed at an additional cost. The explosive contaminated wastewater may seep into cracks in the concrete and accumulate dangerously high levels of explosives over the years. 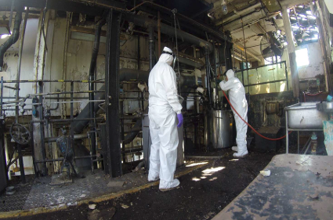 The explosives manufacturing industry has an immediate need for an explosive destruction solution for routine cleaning and maintenance of their manufacturing equipment and work area. Such a solution must not generate a hazardous waste as an end product. 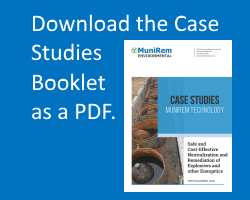 MuniRem is a successfully demonstrated chemical reduction technology for multiple explosives (e.g., AN, black powder, DNTs, HMX, RDX, TNT, picrate, lead styphnate, lead azide, PETN, pyrotechnics, propellants, tetrazene, trinitroresorcinol, TNB, NG), chemical warfare agents such as mustard, and for remediation of chlorinated organics and metals. The MuniRem chemical reagent employs uniquely formulated reduction chemistry to catalyze near instant neutralization of bulk explosives and rapid destruction of MC. The reagent is packaged and shipped in powder form. Manufacturers of explosives now have MuniRem as a cleaning solution that is easy to use. The spray application of MuniRem liquid destroys explosives and generates wastewater characterized as a Non-hazardous waste. Our MuniRem solution is flexible and scalable with a “pay-as-you-go” model, requires NO material upfront costs.